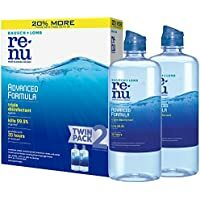 Get 2-Pack Bausch + Lomb ReNu Advanced Formula Triple Disinfect Multi-Purpose Lens Solution (12 Fluid Ounces) from Amazon.com. Tip: Avoid low or no feedback sellers, search and select "Buy It Now" tab and sort by lowest price. You may modify min price to filter accessories to get 2 Pack ReNu auctions.